CULTURE :Needs highly organic soil with good drainage. Even moisture is important. Chelated iron and soil acidifiers are often needed. USES: Screen, specimen, accent, flower fragrance, container plant. PROBLEMS: Aphids, scale, white flies, chlorosis. NOTES: A good dwarf variety exists but has the same problems as the full size plant. 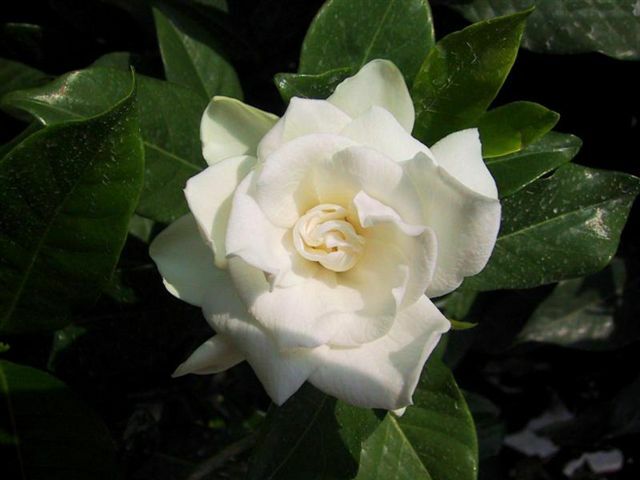 Gardenias are not always easy to grow, but best results come from a comprehensive program of planting them in rich beds, fertilizing with organic fertilizers, and adding a tablespoon of vinegar per gallon of irrigation water. Bed prep for gardenias is: 4” compost, 1” wheat bran/cornmeal/molasses mix, ½” lava sand, ¼” Texas greensand, and natural organic fertilizers at 20 pounds per square feet. Also spray the foliage every two weeks with Garrett Juice, which contains vinegar, or a fish and seaweed product. If vinegar isn’t in the product you choose, add it at 1 ounce per gallon of spray. The other ingredients are also important.